"Then just like a bull, Harry lowered his head. He pawed at the ground and toward them he sped." Anger and stubbornness are frequently seen as praiseworthy attributes in storytelling, whether it be children versus adults or a protagonist versus an elusive organization that is secretly trying to help them. 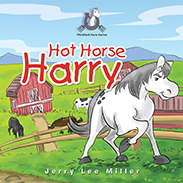 Miller, however, takes a different spin on these traits through Harry, a hot-headed and grumpy horse, and how these often-lauded characteristics can do more harm than good, especially in real-life situations. Harry is not a happy horse. Maybe it is because he is old and especially dislikes flies, but his mean disposition makes him the least favorite on the farm. One day, a fly tries to befriend him, and his temper explodes. He gets his hooves stuck in a rain cloud, and the consequences are disastrous. Needless to say, by the end of it all, Harry learns to not only control his temper but also have a more positive outlook on life and people. Miller portrays the simple yet complex lessons of the story via endearing illustrations that are vibrantly colored and include wonderfully animated expressions. The expressions on Harry’s face throughout the story are priceless, expertly conveying his thoughts and feelings. The reader senses the terror, anger, and regret when Harry makes a terrible mistake during one of his temper tantrums. While the rhymes in the story flow easily and are catchy, there are a couple of word choices that make the prose slightly jarring. However, this does not take away from the story overall, and it is still a delightful treat to read. The author has penned a wonderful book that teaches children of young ages the importance of learning to control one’s temper and not to lash out, showing them clearly that there are consequences to one’s actions.